Angel Falls: A view of Angel Falls from a location near the base. This image by Tomaszp is used here under a Creative Commons license. 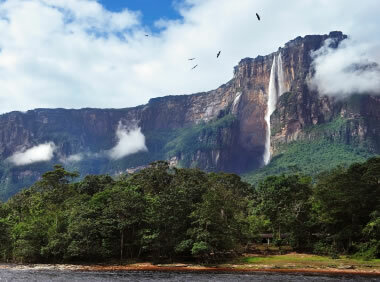 Angel Falls (Salto Ángel) in Venezuela is the highest waterfall in the world. The falls are 3230 feet in height, with an uninterrupted drop of 2647 feet. Angel Falls is located on a tributary of the Rio Caroni. The falls are formed when the tributary stream falls from the top of Auyantepui (a tepui is a flat-topped structure surrounded by cliffs - similar to a mesa). 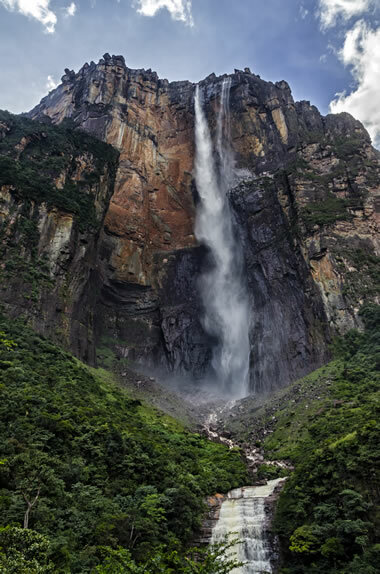 Tallest waterfall on Earth: Angel Falls in Venezuela viewed from a distance. Image copyright iStockphoto / FabioFilzi. Angel Falls location map: Location of Angel Falls in eastern Venezuela. CIA Factbook Map. Yosemite location map: United States Forest Service Map showing the location of Yosemite National Park. View larger map. 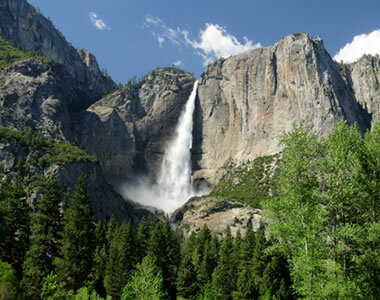 Yosemite Falls in California is the tallest waterfall in the United States. It is located in Yosemite National Park and has a vertical drop of 2425 feet. Tallest waterfall in the USA: Yosemite Falls in Yosemite National Park. Image copyright iStockphoto / SashaBuzko.